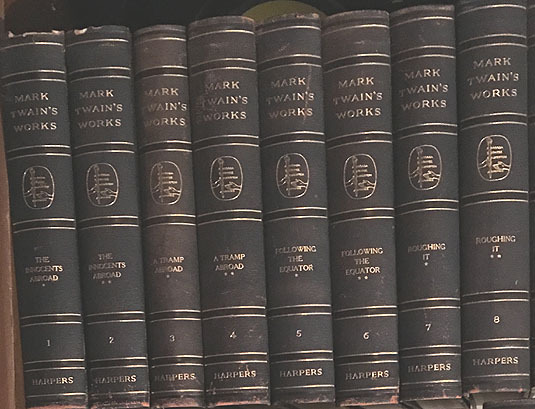 The black half leather binding of Mark Twain's Author's National Edition is perhaps one of the rarest of bindings for this edition. It was the most expensive of the Author's National Edition sets and no production numbers for it have been found. The ads for this binding were found beginning in January 1920 at the bottom of much larger ads for the green cloth Author's National Edition. One of the most extensive descriptions of the binding is from the ad in the National Geographic which ran March 1920. The binding is described as black half leather with silk finished cloth sides, gold letters and gold tops. The price was $6 down and $6 paid in 13 monthly installments for a total of $84. No additional advertising for this binding has been found after May 1920. Image of the Author's National Edition with black leather binding courtesy of Elizabeth Perras.